Dispositions are those character and personality traits that are considered necessary for a person to succeed as a teacher. The traits include areas of responsibility, dependability, creativity, empathy, professionalism, and more. Because NCATE has chosen to identify dispositions as a necessary component of teacher education programs, these programs must make accommodations for presenting these components to students. 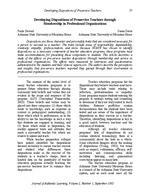 This article describes a study of the effects on pre-service teacher dispositions through membership and service in professional organizations. The effects were measured by interviews and questionnaires administered to the students and their clinical supervisors. The authors describe the perceptions and insights that pre-service teachers reported they gained through their involvement in professional organizations. Submitted by Brian McDonald (bmcdonal@oswego.edu) on 2005-09-06. Made available in DSpace on 2005-09-06T13:39:16Z (GMT).